The story of a woman who, fifteen years before, killed a classmate. The assassin committed this terrible action to summon a ghost, called Mercy Black. After leaving the psychiatric institute that took care of her, she starts having strange visions again. 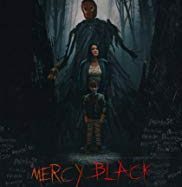 Even her young niece begins to be obsessed with Mercy Black. For the first time, the leading woman clashes with the consequences of what she has done and with the power of a fantastic creature.